Coordinates watershed management activities in the Mattabesset watershed, plans and conducts field stream surveys, assists in implementing Connecticut River Watch Program stream monitoring programs, assists with conservation projects, and provides GIS support for District projects. Board meetings are usually held the fourth Tuesday of the month at 6:00 PM at the deKoven House, and are open to the public. The CT River Coastal Conservation District offers volunteer opportunities throughout the year. Students looking to fulfill community service hours are encouraged to inquire. Every summer and fall, the Connecticut River Watch Program recruits volunteers for river monitoring activities throughout the Connecticut River watershed. In April we invite volunteers to help out at our Shrub & Seedling Sale, an annual fundraising event. We offer hard to find native plants and educate the public about the advantages and importance of planting native species. The District is also involved with ongoing watershed improvement projects such as clean-ups, invasive plant removal, stream buffer plantings, and storm-drain marking that rely on volunteer participation. Students, retirees, or anyone with extra time are encouraged to inquire about assisting with one of our watershed management, water quality monitoring, or natural resource protection projects. The Connecticut River Coastal Conservation District is located on the 2nd floor of the deKoven House, a historic brick mansion at the corner of Washington Street and deKoven Drive, easily accessible from Route 9. Our office is open from 8:30 am to 4:30 pm Monday through Friday. Take I-91 South to Route 9 South (to Cromwell and Middletown). Get off at Exit 15 (Wesleyan University and Washington Street exit). The deKoven House is immediately on your left past the railroad tracks. Take Route 9 North to Exit 15 (on the left). Take I-91 North to Route 66 East. Stay on Route 66 (Washington Street) into Middletown. before the Route 9 intersection. Carpooling can be easy by using CT DOT Park & Ride Locations. Daytime parking is restricted to deKoven House staff and visitors to the offices. Daytime or evening meeting participants can park in the Mellili Plaza parking lot adjacent to the deKoven House (entrance on deKoven Drive or off of Washington Street). Bicycles can be locked to the rack adjacent to the entrance. 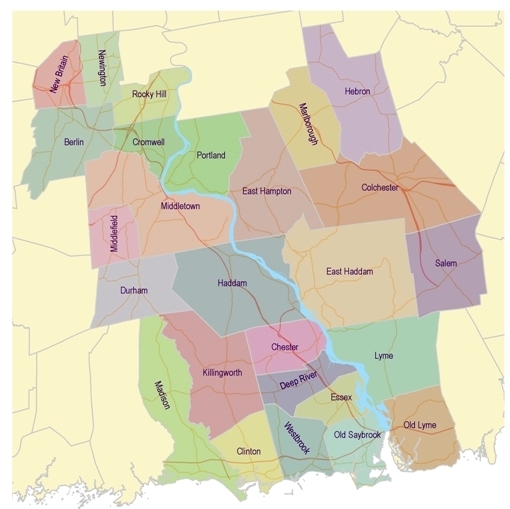 The Connecticut River Coastal Conservation District includes 26 towns in the lower Connecticut River watershed and adjacent coastal watersheds.